● Where are the bikes manufactured? ● Where can I buy Kuberg motorcycles? ● Where can I buy replacement parts for Kuberg motorcycles? ● Can I work for you? ● What is the warranty on Kuberg motorcycles? ● What actions will void the warranty? ● Do I have to bring my Kuberg motorcycle back to the dealership where I bought it for warranty repairs? ● If maintenance is performed by someone other than a Kuberg dealer, will my warranty be voided? ● What are the full details of the warranty? ● What is the correct warranty procedure? ● Where can I find a Kuberg dealer? ● How can I become a dealer? ● How can I become an importer? ● Can you sponsor me? ● Who does Kuberg typically sponsor? ● What should I wear for riding? ● Can I take my friend for a ride? 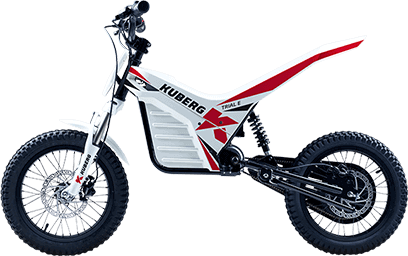 ● Where can I ride my Kuberg motorcycle? ● Will weather affect the riding performance of my Kuberg motorcycle? ● Is my bike legal for road use? ● Do I need to register my bike? Where are the bikes manufactured? All Kuberg motorcycles are manufactured in the Czech Republic. Kuberg is committed to designing and engineering bikes that meet the highest technical standards for quality, performance and reliability. All our bikes are designed and engineered by dedicated technicians in our own R&D department and are all assembled in our plant using our own parts or parts designed specifically to our specs. 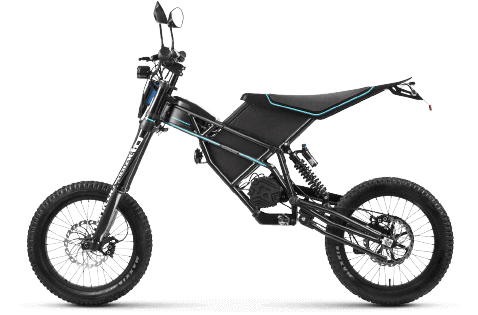 This ensures that all Kuberg bikes conform to our mission statement - to create heavy-duty, high-performance electric bikes that deliver huge power, massive torque and unparalleled acceleration with a build quality that's engineered to last. Where can I buy Kuberg motorcycles? You can buy your Kuberg motorcycle from a dealer in your area (to find a dealer near you visit www.kuberg.com/dealers) or order one online directly from us by writing to kuberg@kuberg.com. Where can I buy replacement parts for Kuberg motorcycles? The best way is to get in touch with your local dealer, who will help you to order the right part. To find a dealer near you visit www.kuberg.com/dealers. Alternatively, please contact us at kuberg@kuberg.com and our customer service team will help to to receive a part you need. We are always looking for talented and passionate men and women to join our growing team. Please send your resume to kuberg@kuberg.com and we'll be in touch. What is the warranty on Kuberg motorcycles? All Kuberg motorcycles come with a thirty (30) day Basic Manufacturer's Warranty against defects in materials and workmanship. You can upgrade to a three (3) month Limited Warranty by registering your bike at www.kuberg.com/bike-registration. A twelve (12) month Extended Warranty can be purchased for €119 for Young Rider and Hero models and €199 for Freerider and X-Force Pro 50 models. What actions will void the warranty? Tampering with or dismantling the electrical components, batteries and motor. These parts are crucial for proper functioning and performance of your Kuberg motorcycle and should not be modified, removed or dismantled. In addition, your warranty does not cover any mechanical faults or malfunctions due to misuse or lack of proper maintenance. Do I have to bring my Kuberg motorcycle back to the dealership where I bought it for warranty repairs? No. You may take your Kuberg motorcycle to any authorized Kuberg dealer for warranty repairs. All Kuberg dealers will be eager and willing to help you. If maintenance is performed by someone other than a Kuberg dealer, will my warranty be voided? Yes. During the first year, the bike is required to receive scheduled maintenance at 3 and 6 months from an authorised Kuberg dealer in order for the Limited or Extended warranties to remain active. If maintenance is preformed by someone other than a Kuberg dealer, Kuberg is no longer responsible for damages and the warranties will no longer be valid. What are the full details of the warranty? Kuberg motorcycles are warranted to the original retail purchaser to be free from defects in materials and workmanship in the frame and components except for batteries, tires, and inner tubes for a period of thirty (30) days from the date of purchase. An upgrade to a three (3) month Limited Warranty is available to the original retail purchaser who registers his/her bike via the registration form on www.kuberg.com/bike-registration. A further optional Extended Warranty is available for a fee. A twelve (12) month Extended Warranty can be purchased for €119 for Young Rider and Hero models and €199 for Freerider and X-Force Pro 50 models. Warranty is valid for 3 months/12 months from the purchase date of the bike via a Kuberg dealership. Warranty is non-transferable. All warranties are voided upon secondhand re-sales. Batteries are warranted to the original retail purchaser to be free from defects in materials and workmanship for the first 300 charging cycles where they have to keep more than 80% of their initial capacity, provided charging, maintenance and storage instructions are properly followed. Tires and tubes are warranted to be free of manufacturing and material defects for thirty (30) days. Such tire and tube warranty shall not include flat tires, tire cuts, skid through, over-inflation blowouts, or other such misuse or normal hazards. This warranty does not apply to any products or components, mechanical and/or electrical, which have in any way been altered from their original configuration by any person. Kuberg will not be liable and/or responsible for any damage, failure or loss caused by any unauthorized service or use of unauthorized parts. Warranties do not cover or apply to any Kuberg product used for rental or commercial purposes unless the specific product is designated, labeled, or marketed by Kuberg as acceptable for rental or commercial use. All warranty claims must be made directly to original selling retailer. The selling retailer is the primary provider of warranty support and customer service. Kuberg may choose to perform warranty service at the sole discretion of Kuberg. The original owner of the product must provide proof of purchase prior to approval of any warranty claim. Under no circumstances do our warranties include any costs associated with shipment and/or transportation to or from retailer, distributor or Kuberg. Kuberg, at its sole discretion, has the option of replacing with a new part, a factory recertified part, or repairing any defective product and/or component thereof, or to pay to the owner of such product an amount equal to the original purchase price of such product. The original owner shall pay for all costs of labor associated with any warranty claims. This warranty supersedes all previous warranties. The warranties stated herein are in lieu of and expressly exclude all other warranties not expressly set forth herein, whether expressed or implied by law or otherwise, including, but not limited to, any warranties for merchantability and/or fitness for any particular purpose. 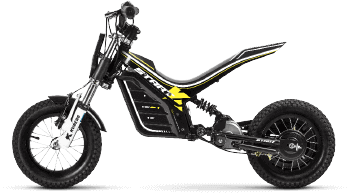 Kuberg shall in no event be liable or responsible for incidental or consequential losses, damages or expenses in connection with their electric dirt bike products. The liability of Kuberg hereunder is expressly limited to the replacement of goods complying with this warranty or at the sole election of Kuberg to the repayment of an amount equivalent to the purchase price of the product in question. CAUTION! Some states may not permit the exclusion or limitation of consequential damages and therefore, such limitations may not apply to the consumer in which such impermissible exclusions are involved. Operate and maintain the motorcycle as specified in the appropriate Owner’s Manual. Give notice to an authorized Kuberg dealer of any and all apparent defects within ten (10) days after discovery, and make the machine available at the time for inspection and repairs at the dealer’s place of business. What is the correct warranty procedure? For step-by-step instructions to file a warranty claim, please follow this link. Where can I find a Kuberg dealer? You can find a Kuberg dealer near you on the dealers section of our website: www.kuberg.com/dealers. We always welcome new and passionate companies to help us get Kuberg motorcycles to all parts of the world. Please get in touch with us at dealers.kuberg.com or via email at kuberg@kuberg.com for more information. How can I become an importer? Get in touch with our marketing team by writing an email to kuberg@kuberg.com with a letter describing your activities, successes, goals and financial needs. Our team will contact you if there is any potential for sponsorship. Who does Kuberg typically sponsor? Our main focus is on electric motorcycle riders, but our team will consider all interesting applications. Get in touch with us by writing an email to kuberg@kuberg.com. What should I wear for riding? Motorcycle leathers to prevent abrasion injuries in the event of a fall. Failure to use appropriate safety equipment greatly increases the likelihood of death or serious injury in the event of an accident. Never wear loose-fitting clothes, as they can catch on wheels, chains, control levers or footrests. Do not wear shoes with laces, as these can get caught in the motorcycle's chain or wheels and result in serious injury. Can I take my friend for a ride? No. Kuberg motorcycles are engineered to carry only one rider and no passengers. Carrying a passenger will overload the motorcycle and damage the handling. Do not ride with any passengers. Where can I ride my Kuberg motorcycle? Obey all laws. Kuberg motorcycles are for OFF-ROAD USE ONLY. The purchaser, owner, and/or riders of this motorcycle are directly responsible for knowing and obeying all local, state and country laws regarding the riding and use of this motorcycle. Our road-legal Freerider Street Edition is coming in Summer 2018. Please keep checking our website and social media. Will weather affect the riding performance of my Kuberg motorcycle? Please be aware that distance to stop under wet conditions may double or triple compared to dry conditions. Ride more slowly, and anticipate your stops by applying the brakes sooner. Please also bear in mind that cold weather might negatively affect batteries, lowering the maximum power and charge. This is normal for electric motorcycles and does not require maintenance or service. Is my bike legal for road use? Kuberg motorcycles are designed primarily for OFF-ROAD use. Please check your local, state and country regulations whether single-track, motorized electric vehicles are legal for road use in your area. Our road-legal Freerider Street Edition is coming in Summer 2018. Please keep checking our website and social media. Do I need to register my bike? Follow the steps below to install the Streamport for Young Rider Bikes: Start, Trail, Cross and Trial Hero and Cross Hero. Remove the bolts to the seat and seat panel. Remove the seat and seat panel (if you need extra workspace, you can also remove the side panel). Locate the 4-hole connector at the front of the controller. Plug the Streamport’s 4-prong cord into the connector. Place the Streamport on top of the controller and secure it in place with the metal bracket. Use the same bolt that holds the controller in place to secure it to the frame. Extend the antenna wire and attach it underneath the seat panel using the adhesive. Replace the seat panel and seat and re-attach the bolts. Note: The Young Rider Start bike has a tight space for the adapter. As an alternative, you can set the adapter on the side of the controller rather than on top of it, though you won’t be able to secure it with the metal bracket. Follow the steps below to install the Streamport for Freerider. Remove the controller cover by removing one bolt locate above the LED light using an alan key. Attach the Streamport’s 4-pin cord into the controller’s 4-hole cord. The two pieces will snap together in place. Place the Streamport on top of the controller and secure it in place with the metal bracket or velcro straps. Extend the antenna wire and attach it underneath the seat panel using the adhesive. Alternatively you are free to keep the antenna under the plastic controller cover. Replace the controller cover and re-attach the bolt. **Older Freerider models might have not have the 4-hole cord attached. Your dealer will have an extension reduction cable that they can install for you to get your Streamport working. Do not attempt to open the controller yourself. Doing so will void its warranty and can damage your bike. Follow the steps below to install the Streamport for Freerider and X-Force Pro 50. Place the Streamport on top of the controller and secure it with the supplied metal bracket or a velco strap. **Older X-Force Pro 50 models might have not have the 4-hole cord attached. Your dealer will have an extension reduction cable that they can install for you to get your Streamport working. Do not attempt to open the controller yourself. Doing so will void its warranty and can damage your bike. Download the Kuberg Volt App via the iOS App Store for iPhone or on Google Play for Android. Open your phone’s WiFi settings and locate your bike. Follow the steps on your app to connect and set up your bike. Some bikes might need a firmware update to communicate with the bike. Test the app to make sure it is in sync with your bike. Lift the bike off the ground and twist the throttle. The app will react to the throttle movements. ● What steps should I take before and after the first ride? ● What is the correct charging procedure? ● How do I select the bike's power and speed settings? ● How long is the break-in period? ● What is the correct charging procedure for Kuberg Start? ● How can I limit the power and torque on my Kuberg Start? ● How can I limit the maximum speed on my Kuberg Start? ● Does weather affect the performance of my bike? ● What maintenance should I do regularly? ● Can anyone perform my maintenance? ● Can I disassemble bike's electric controls? ● What is the correct tire pressure for Kuberg Start? ● What causes brake squeal? ● What are the recommended replacement tires for Kuberg Start? ● What is the correct charging procedure for Kuberg Trial E? ● How can I limit the power and torque on my Kuberg Trial E? ● How can I limit the maximum speed on my Kuberg Trial E? ● What is the correct tire pressure for Kuberg Trial E? ● What are the recommended replacement tires for Kuberg Trial E? ● What is the correct charging procedure for Kuberg Cross? ● How can I limit the power and torque on my Kuberg Cross? ● How can I limit the maximum speed on my Kuberg Cross? ● What is the correct tire pressure for Kuberg Cross? ● What are the recommended replacement tires for Kuberg Cross? ● What is the correct charging procedure for Kuberg Trial? ● How can I limit the power and torque on my Kuberg Trial? ● How can I limit the maximum speed on my Kuberg Trial? ● What is the correct tire pressure for Kuberg Trial? ● What are the recommended replacement tires for Kuberg Trial? 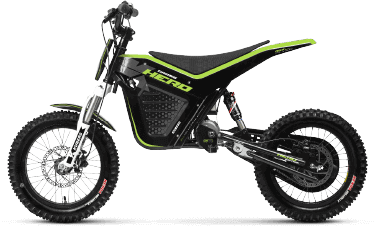 ● What is the correct charging procedure for Kuberg Trial Hero? ● How can I limit the power and torque on my Kuberg Trial Hero? ● How can I limit the maximum speed on my Kuberg Trial Hero? ● What is the correct tire pressure for Kuberg Trial Hero? ● What are the recommended replacement tires for Kuberg Trial Hero? ● What is the correct charging procedure for Kuberg Cross Hero? ● How can I limit the power and torque on my Kuberg Cross Hero? ● How can I limit the maximum speed on my Kuberg Cross Hero? ● What is the correct tire pressure for Kuberg Cross Hero? ● What are the recommended replacement tires for Kuberg Cross Hero? 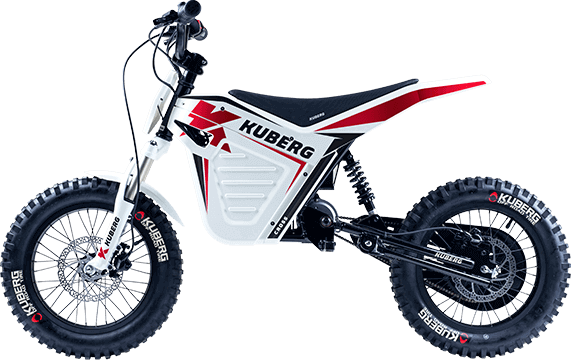 ● What is the correct charging procedure for Kuberg Freerider? ● How can I limit the power and torque on my Kuberg Freerider? ● How can I limit the maximum speed on my Kuberg Freerider? ● What is the correct tire pressure for Kuberg Freerider? ● What are the recommended replacement tires for Kuberg Freerider? ● What is the correct charging procedure for Kuberg Cross X-Force PRO 50? ● How can I limit the power and torque on my Kuberg Cross X-Force PRO 50? ● What is the correct tire pressure for Kuberg Cross X-Force PRO 50? ● What are the recommended replacement tires for Kuberg Cross X-Force PRO 50? What steps should I take before and after the first ride? Follow these steps when you first buy your Kuberg motorcycle. Take the Kuberg motorcycle of out the box (if you've received it in factory packaging). Make sure the battery is fully charged by charging your bike to a 99-100% charge. Please follow the correct charging procedure to prevent damage to your bike's batteries or charger. Set up bike's maximum power and top speed to suit rider's experience, we recommend to start slow. Go for your first ride, don't forget to take it slow and easy! Charge the battery again to a full charge when you return from your first ride. If you buy your Kuberg motorcycle at an authorized dealer, the dealer will assist you through the set-up procedure. What is the correct charging procedure? Make sure your Kuberg Start is turned off. Make sure the electricity cable is plugged into the charger. Connect your charger to an electrical outlet (AC). Connect the charger cable to the battery connector on your Kuberg Start. Caution! If the charger is plugged into the bike with the charger switched OFF, a potential in-rush of electrical current from the bike's battery to the charger may damage the charger. The recommended charging time for a fully discharged battery is 6 hours. How do I select the bike's power and speed settings? You can limit both the maximum power and top speed on your KUBERG Start. These can be set from the Kuberg Volt app (iOS and Android) or with bike's programming button. Press and hold the control button located on the right side in the plastic panel near the front wheel. The battery level indicator next to the throttle will flash one, two or three times to indicate the desired power mode. One flash indicates Beginner Mode (low-power), two flashes indicate Sports Mode (medium-power) and three flashes indicate Race Mode (maximum-power). Let go of the control button after the number of flashes corresponding to your desired power mode. For example, if you want the medium power mode, hold the control button for two flashes and release. The power mode is set. If you want to set a different power mode level, repeat the process from step 1. Please note that some older models might have an on/off switch in addition to the magnetic kill switch. In that case, keep the magnetic kill switch in ON position and turn on/off the bike with the on/off switch. With the bike on, hold the programming button in for 5 seconds - The throttle LED lights will flash. - This means that programming mode has been selected. Release the button and lift the back of the bike carefully and turn the throttle. Warning! Rear wheel will spin during the set up procedure! Hold the throttle at the desired speed level for several seconds until the throttle LED lights flash again. The bike will then automatically turn on and back on again (this means the bike has now programmed to that top speed). The top speed will now be set at that speed. The bike will remain in this speed setting if turned off and back on, and does not need to be re-selected each time. To select another top speed, repeat this process. If you want to set again the maximum possible top speed, set a new Power mode. How long is the break-in period? To assure future reliability and top-notch performance of your Kuberg motorcycle, pay extra attention during your first 50 km / 30 miles (three full-charge cycles). Avoid full-throttle starts and accelerate gradually. Avoid hard braking. New brakes need some time to break in with moderate use for the first 50 km / 30 miles or three full charges. What is the correct charging procedure for Kuberg Start? Only use the supplied battery charger. Using any other battery charger will void the warranty and may damage the battery. The battery charger supplied with your Kuberg Start is for INDOOR use only. Do not cover the charger while charging, this can cause the charger to overheat. Avoid any contact with water or other fluids while charging the battery. If the battery, charger or any connections become wet, immediately unplug the charger and thoroughly dry all components. Only charge under constant supervision of an adult. Children must not operate the charger. Keep the charger and the motorcycle must be away from flammable items during charging. Never dismantle or disassemble the supplied charger. Never use the supplied charger for any other purpose other than charging a KUBER Start motorcycle. How can I limit the power and torque on my Kuberg Start? Caution! Sport and Race modes should only be used by very experienced riders! Please note that some older models might have an on/off switch in addition to the magnetic kill switch. In that case, keep the magnetic kill switch in ON position and turn on/off the bike with the on/off switch. How can I limit the maximum speed on my Kuberg Start? Release the button and lift the back of the bike carefully and turn the throttle. The maximum speed is set. If you want to set a different maximum speed, repeat the process from step 1. Warning! The rear wheel will spin during the TOP SPEED set up procedure. Make sure that the rear wheel and chain cannot cause harm to you or other people, or come into contact with clothing, bags or other items. Make sure that the bike is firmly placed on its stand. Does weather affect the performance of my bike? Yes. Very cold weather is hard on the batteries and, as a result, the battery charge won't last as long compared to warm weather. What maintenance should I do regularly? Kuberg motorcycles generally require significantly less maintenance compared to traditional gas bikes due to their having very few moving parts, no engine and no exhaust. Make sure to take care of your chain, by cleaning and lubricating it regularly and checking that the chain is tightened properly. Also, regularly check for wear and tear to your tires and brake pads. 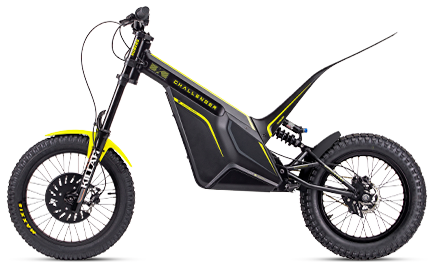 During the first year, the bike is required to receive scheduled maintenance at 3 and 6 months from an authorised Kuberg dealer in order for the Limited or Extended warranties to remain active. Can anyone perform my maintenance? During the first year, the bike is required to receive scheduled maintenance at 3 and 6 months from an authorised Kuberg dealer in order for the Limited or Extended warranties to remain active. If maintenance is preformed by someone other than a Kuberg dealer, Kuberg is no longer responsible for damages and the warranties will no longer be valid. Can I disassemble bike's electric controls? No. 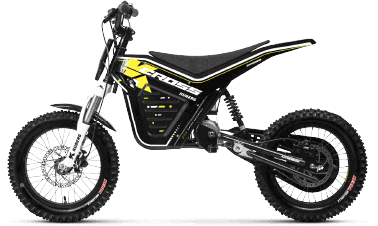 The controller electric system is crucial for your Kuberg motorcycle to function properly and therefore should not be opened, modified or changed. Should you encounter a problem with the bike's electric system, get help from a certified Kuberg service center or a Kuberg dealer. What is the correct tire pressure for Kuberg Start? The optimal tire pressure for Kuberg Start is 35-40 PSI (2.4-2.8 bar) for general use and should never exceed 50 PSI (3.4 bar). Dirt and humidity can cause noisy or squealing brakes. These are normally temporary and should gradually disappear with regular use. Repair is not required. If you hear a metallic 'screeching' sound you might need to replace the brake pads. Visit your Kuberg dealer to replace the brake pads. What are the recommended replacement tires for Kuberg Start? Your Kuberg dealer will have genuine replacement tires in stock for all Kuberg models. The correct tire size for Kuberg Start is Kuberg 12.5" x 2.4. Make sure your Kuberg Trial E is turned off. Make sure the electricity cable is plugged into the charger. Connect your charger to an electrical outlet (AC). 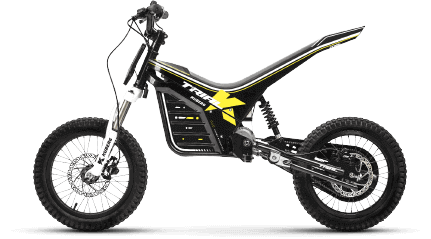 Connect the charger cable to the battery connector on your Kuberg Trial E.
You can limit both the maximum power and top speed on your KUBERG Trial E. These can be set from the Kuberg Volt app (iOS and Android) or with bike's programming button. Press and hold the programming button located on the top panel between the seat and the steering column. What is the correct charging procedure for Kuberg Trial E? The battery charger supplied with your Kuberg Trial E is for INDOOR use only. Never dismantle or disassemble the supplied charger. Never use the supplied charger for any other purpose other than charging a KUBER Trial E motorcycle. How can I limit the power and torque on my Kuberg Trial E? Press and hold the control button located on the top panel between the seat and the steering column. How can I limit the maximum speed on my Kuberg Trial E? You can use the Kuberg Volt app (WiFi Streamport sold separately) or bike's hardware button to set a maximum speed. Follow these steps to use's bike's programming button. With the bike on, hold the programming button (located on the top panel between the seat and the steering column) for 5 seconds - The throttle LED lights will flash. - This means that programming mode has been selected. Warning! The rear wheel will spin during the set-up procedure. Release the programming button and lift the back of the bike carefully and turn the throttle. What is the correct tire pressure for Kuberg Trial E? The optimal tire pressure for Kuberg Trial E is 35-40 PSI (2.4-2.8 bar) for general use and should never exceed 50 PSI (3.4 bar). What are the recommended replacement tires for Kuberg Trial E? Your Kuberg dealer will have genuine replacement tires in stock for all Kuberg models. The correct tire size for Kuberg Trial E is Kenda 16" x 2.4. Make sure your Kuberg Cross is turned off. Make sure the electricity cable is plugged into the charger. Connect your charger to an electrical outlet (AC). Connect the charger cable to the battery connector on your Kuberg Cross. You can limit both the maximum power and top speed on your KUBERG Cross. These can be set from the Kuberg Volt app (iOS and Android) or with bike's programming button. What is the correct charging procedure for Kuberg Cross? The battery charger supplied with your Kuberg Cross is for INDOOR use only. Never dismantle or disassemble the supplied charger. Never use the supplied charger for any other purpose other than charging a KUBER Cross motorcycle. How can I limit the power and torque on my Kuberg Cross? How can I limit the maximum speed on my Kuberg Cross? What is the correct tire pressure for Kuberg Cross? The optimal tire pressure for Kuberg Cross is 35-40 PSI (2.4-2.8 bar) for general use and should never exceed 50 PSI (3.4 bar). What are the recommended replacement tires for Kuberg Cross? Your Kuberg dealer will have genuine replacement tires in stock for all Kuberg models. The correct tire size for Kuberg Cross is Kuberg Knobby 16" x 2.4. Make sure your Kuberg Trial is turned off. Make sure the electricity cable is plugged into the charger. Connect your charger to an electrical outlet (AC). Connect the charger cable to the battery connector on your Kuberg Trial. You can limit both the maximum power and top speed on your KUBERG Trial. These can be set from the Kuberg Volt app (iOS and Android) or with bike's programming button. What is the correct charging procedure for Kuberg Trial? The battery charger supplied with your Kuberg Trial is for INDOOR use only. Never dismantle or disassemble the supplied charger. Never use the supplied charger for any other purpose other than charging a KUBER Trial motorcycle. How can I limit the power and torque on my Kuberg Trial? How can I limit the maximum speed on my Kuberg Trial? What is the correct tire pressure for Kuberg Trial? The optimal tire pressure for Kuberg Trial is 35-40 PSI (2.4-2.8 bar) for general use and should never exceed 50 PSI (3.4 bar). What are the recommended replacement tires for Kuberg Trial? Your Kuberg dealer will have genuine replacement tires in stock for all Kuberg models. The correct tire size for Kuberg Trial is Kenda 16" x 2.4. You can use the Kuberg Volt app (WiFi Streamport sold separately) or bike's hardware button to set a maximum speed. Follow these steps to use bike's programming button. 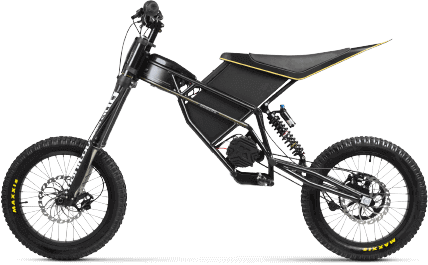 Kuberg motorcycles generally require significantly less maintenance compared to traditional gas bikes due to their having very few moving parts, no engine and no exhaust. Our authorized dealers have extensive experience and know Kuberg bikes inside and out, so they can provide high-quality service for your Kuberg motorcycle. However, service at a dealer is not required to maintain your warranty. Make sure your Kuberg Trial Hero is turned off. Make sure the electricity cable is plugged into the charger. Connect your charger to an electrical outlet (AC). Connect the charger cable to the battery connector on your Kuberg Trial Hero. You can limit both the maximum power and top speed on your KUBERG Trial Hero. These can be set from the Kuberg Volt app (iOS and Android) or with bike's programming button. 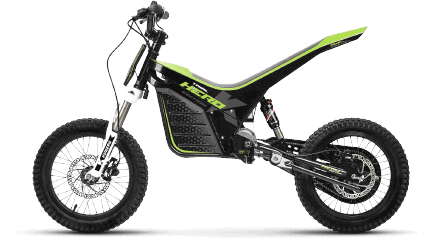 What is the correct charging procedure for Kuberg Trial Hero? The battery charger supplied with your Kuberg Trial Hero is for INDOOR use only. Never dismantle or disassemble the supplied charger. Never use the supplied charger for any other purpose other than charging a KUBER Trial Hero motorcycle. How can I limit the power and torque on my Kuberg Trial Hero? How can I limit the maximum speed on my Kuberg Trial Hero? What is the correct tire pressure for Kuberg Trial Hero? The optimal tire pressure for Kuberg Trial Hero is 35-40 PSI (2.4-2.8 bar) for general use and should never exceed 50 PSI (3.4 bar). What are the recommended replacement tires for Kuberg Trial Hero? Your Kuberg dealer will have genuine replacement tires in stock for all Kuberg models. The correct tire size for Kuberg Trial Hero is Kenda 16" x 2.4. Make sure your Kuberg Cross Hero is turned off. Make sure the electricity cable is plugged into the charger. Connect your charger to an electrical outlet (AC). Connect the charger cable to the battery connector on your Kuberg Cross Hero. You can limit both the maximum power and top speed on your KUBERG Cross Hero. These can be set from the Kuberg Volt app (iOS and Android) or with bike's programming button. 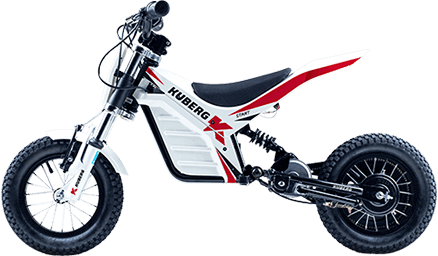 What is the correct charging procedure for Kuberg Cross Hero? The battery charger supplied with your Kuberg Cross Hero is for INDOOR use only. Never dismantle or disassemble the supplied charger. Never use the supplied charger for any other purpose other than charging a KUBER Cross Hero motorcycle. How can I limit the power and torque on my Kuberg Cross Hero? How can I limit the maximum speed on my Kuberg Cross Hero? What is the correct tire pressure for Kuberg Cross Hero? The optimal tire pressure for Kuberg Cross Hero is 35-40 PSI (2.4-2.8 bar) for general use and should never exceed 50 PSI (3.4 bar). What are the recommended replacement tires for Kuberg Cross Hero? Your Kuberg dealer will have genuine replacement tires in stock for all Kuberg models. The correct tire size for Kuberg Cross Hero is Kuberg Knobby 16" x 2.4. Make sure your KUBERG Freerider is turned off. Plug the charger into an electrical outlet (AC). Turn on charger and wait for 15 seconds. Plug the charger into the bike. The recommended charging time for a fully discharged battery is 2.5 hours. After 1.5 hours of charging, the battery should be charged to about 80%. After 2.5 hours, the battery should be charged to 99% of capacity. Once the battery is fully charged, the fans on the charger will stop running loudly for several minutes. When the battery is charged: unplug the bike, turn off the charger, and unplug from the wall. The battery charger supplied is intended for INDOOR use only. Do not block the fan vent on the charger while charging the battery. This can cause the charger to overheat. The charger and motorcycle must be kept away from flammable items during charging. Never dismantle or disassemble the supplied charger. Never use the supplied charger for any other purpose other than charging a KUBERG Freerider motorcycle. Press and hold the control button located on the left side below next to the steering column. The bike will beep one, two or three times to indicate the desired power mode. One beep indicates Beginner Mode (low-power), two beeps indicate Sport Mode (medium-power) and three beeps indicate Race Mode (maximum-power). For example, if you want the medium power mode, hold the control button for two beeps and release. The bike will confirm your selection with audible 'one', 'two' or 'three' sounds. What is the correct charging procedure for Kuberg Freerider? The battery charger supplied with your Kuberg Freerider is for INDOOR use only. How can I limit the power and torque on my Kuberg Freerider? How can I limit the maximum speed on my Kuberg Freerider? Unfortunately, you cannot set the top speed on your Freerider, but you can limit the maximum power and torque if needed. What is the correct tire pressure for Kuberg Freerider? The optimal tire pressure for Kuberg Freerider is 35-50 PSI (2.4-3.4 bar) for general use and should never exceed 50 PSI (3.4 bar). What are the recommended replacement tires for Kuberg Freerider? Your Kuberg dealer will have genuine replacement tires in stock for all Kuberg models. The correct tire size and recommended tire brand for Kuberg Freerider is Maxxis Creepy Crawler 20" x 2.5". Make sure your Kuberg X-Force Pro 50 is turned off. Never dismantle or disassemble the supplied charger. 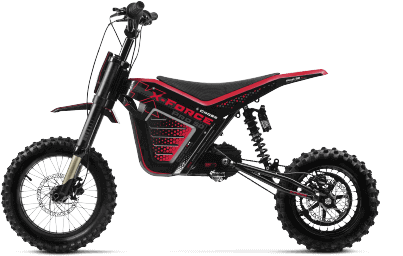 Never use the supplied charger for any other purpose other than charging a KUBERG X-Force Pro 50 motorcycle. The bike can be set to a slower power mode for beginner riders, seasoned racers will want to double check whether bike's maximum power has been set. Press and hold the control button located on the top panel, between the seat and the steering column. What is the correct charging procedure for Kuberg Cross X-Force PRO 50? Make sure your Kuberg Cross X-Force Pro 50 is turned off. The battery charger supplied with your Kuberg Cross X-Force Pro 50 is for INDOOR use only. Never dismantle or disassemble the supplied charger. Never use the supplied charger for any other purpose other than charging a KUBERG Cross X-Force Pro 50 motorcycle. How can I limit the power and torque on my Kuberg Cross X-Force PRO 50? What is the correct tire pressure for Kuberg Cross X-Force PRO 50? The optimal tire pressure for Kuberg Cross X-Force Pro 50 is 35-50 PSI (2.4-3.4 bar) for general use and should never exceed 50 PSI (3.4 bar). What are the recommended replacement tires for Kuberg Cross X-Force PRO 50? Your Kuberg dealer will have genuine replacement tires in stock for all Kuberg models. 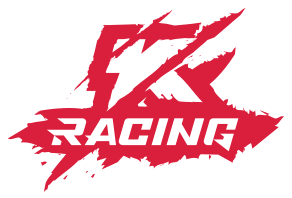 The correct tire size and recommended tire brand for Kuberg Cross X-Force Pro 50 is Kenda Millville 70/100-10 38J for the rear tire and Kenda Millville 60/100-12 38J for the front.